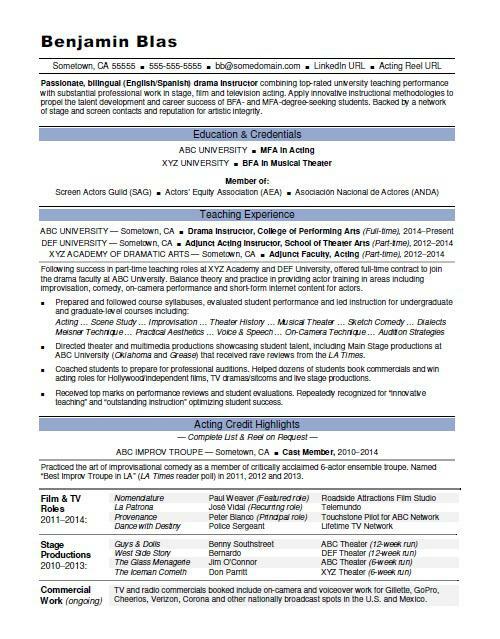 View this sample resume for an actor, or download the acting resume template in Word. Like a movie script, a winning resume tells a compelling story—and you’re the lead actor or lead actress hoping for the role of a lifetime. To be a successful candidate for acting gigs, resume expert Kim Isaacs says it helps to have a superstar resume. To see how you can land the part, view this sample resume for acting that Isaacs created below, or download the acting resume template in Word. Jobs for actors are projected to grow by 12% (or 7,400 jobs) from 2016 through 2026, which is faster than average, according to the Bureau of Labor Statistics (BLS). You'll find the highest level of employment for this job in the following states: California, New York, Illinois, Georgia, and Texas; and in the following metropolitan areas: New York City, Los Angeles, Houston, Chicago, and Atlanta. As an actor, you can expect to earn a median wage of $17.49 per hour, according to the BLS. Additionally, you can search for acting jobs on Monster. Passionate, bilingual (English/Spanish) drama instructor combining top-rated university teaching performance with substantial professional work in stage, film and television acting. Apply innovative instructional methodologies to propel the talent development and career success of BFA- and MFA-degree-seeking students. Backed by a network of stage and screen contacts and reputation for artistic integrity. Following success in part-time teaching roles at XYZ Academy and DEF University, offered full-time contract to join the drama faculty at ABC University. Balance theory and practice in providing actor training in areas including improvisation, comedy, on-camera performance and short-form internet content for actors. Directed theater and multimedia productions showcasing student talent, including Main Stage productions at ABC University (Oklahoma and Grease) that received rave reviews from the LA Times. Coached students to prepare for professional auditions. Helped dozens of students book commercials and win acting roles for Hollywood/independent films, TV dramas/sitcoms and live stage productions. Received top marks on performance reviews and student evaluations. Repeatedly recognized for “innovative teaching” and “outstanding instruction” optimizing student success. Practiced the art of improvisational comedy as a member of critically acclaimed 6-actor ensemble troupe. Named “Best Improv Troupe in LA” (LA Times reader poll) in 2011, 2012 and 2013. TV and radio commercials booked include on-camera and voiceover work for Gillette, GoPro, Cheerios, Verizon, Corona and other nationally broadcast spots in the U.S. and Mexico. You wouldn't take the stage without practicing your lines, right? Well, don't send your resume out on a job search without ensuring its lines are ready for the spotlight. Could you use some help with that? Get a free resume evaluation today from the experts at Monster's Resume Writing Service. You'll get detailed feedback in two business days, including a review of your resume's appearance and content, and a prediction of a recruiter's first impression. It's a quick and easy way to get your resume into job-search character.